The extra pounds in January are earned after the holiday’s hard work (as we eat holiday left-overs). If you want to eat tasty dishes and be a healthy being at the same time, this article is for you. I’ll introduce you to some delicious recipes for your Holiday dishes with a vegan twist. Scroll down and you’ll find a whole dinner plan with 6 classic dishes for an incredible feast with vegan ingredients. Before walking through each vegan recipe, let me introduce you to popular non-vegan ingredients in common Holidays’ recipes with its ingenious vegan substitute. You can use them as a reference not only for Holiday dishes but to your daily life as well. Are Meatless Mondays on your next-year resolution? Use this tables to guide you and check the links if you want further information. The following comparisons are creative suggestions. You can explore more and substitute pork for tofu or eggs for chia. You could use tempeh, beans or vegetables too. ● Reduces the risk of heart disease and diabetes. ● Lowers the risk of breast, prostate and digestive system’s cancer. ● Influences positively on the menstrual cycle and cramps. ● Enhances the brain function. ● Helps with weight loss. Turkey is not that helpful, huh? Seitan is made of gluten from wheat. It absorbs the flavours amazingly and has a meat-like texture. It’s widely used in the Asian cuisine as a meat substitute. It has more proteins and less fat than pork loin, it’s low in sodium and it’s very versatile. I suggest you take the time and make your own seitan at home. Commercially prepared versions tend to have high levels of sodium and other unhealthy additives. You can prepare it with gluten flour, mixing it with the herbs you like and adding water until you have a dough-like texture. You can reduce the “chewiness” by freezing the dough before cooking it. Tofu isn’t recommended for patients with kidney stones, breast tumours, and thyroid issues. If you have any of those, consult your MD before including tofu to your diet. Don’t consume seitan if you have celiac disease or gluten allergies. ● They’re a natural laxative due to their high amount of fiber. ● Help to prevent heart disease. ● Have omega-3, which prevents some chronic diseases. ● Help to lose weight.Start adding these amazing seeds to your dishes! Got milk? Plant-based, please. ● Believe it or not, studies suggest that coconut milk might help to lose weight. It reduces appetite and increases the metabolism. ● It has “antibacterial” properties. It reduces the levels of bacteria and viruses, including the ones in your mouth. please take some extra time to read this article. Soak 1 tbsp. of flaxseeds in 3 tbsps. of water. Within a while, it will become a gel-like substance equivalent to one egg white. Grounded flaxseeds are the perfect vegan egg substitute for baking. The coconut milk mentioned here is beverage-like. It’s diluted. Thicker kinds of it are commonly used in Indian and Caribbean cuisine and differ greatly in their nutritional facts. Being vegan or having a plant-based diet doesn’t mean that tasty dishes are off-limits. It’s the contrary. You can have a vegan holiday feast and eat delicious food until you look like a Botero’s painting (please, don’t). Disclaimer:The recipes shown next are adaptations of other original vegan recipes. The title of each links back to the original recipe.The nutritional facts shown come from “My Fitness Pal” recipe calculator and the ingredients of the original recipe. These aren’t only for Holidays. You can make them any time of the year, for a vegan party or a movie night. The “pigs” are a traditional accompaniment in a UK Christmas dinner. Their larger version, the “sausage rolls”, are often served as breakfast or lunch in Europe and Australia, mostly. GOOD FOR: Snack time, entrée. ● 1 cup of crescent roll dough. ● 1 cup vegan cheese shreds. ● 1 pkg. vegan bacon slices. ● 2 pkgs. veggie dogs. 1. Preheat the oven to 375˚ F.
2. Cut the veggie dogs into halves. 3. Cut the crescent roll dough into triangles. The half-veggie dog must be larger than the base of the triangle. 4. Organize the triangles on a foil-lined baking sheet. Add the vegan cheese on top of them. 5. Wrap a vegan bacon slice around each veggie-dog half. Then, wrap it with a piece of dough. 6. Bake until golden brown. As the pigs, the devils can be made for any occasion, not only for a vegan health holiday! For a tasty entrée and a digestive aid (a food superhero, basically), replace the dates for prunes; they are the best way to prevent and treat constipation. Also, you can change the dates for apricots and make angels instead of devils. ● 20 pitted dried dates. ● 20 teaspoons of cashew cheese. ● 20 strips of grilled eggplant. Preheat the oven to 350˚ F.
Soak the dates in hot water for a few minutes to soften. Open them up, gently. If they’re already pitted, they’ll probably have one side split already. Stuff the date with the cashew cheese. Wrap it up with the eggplant strip and secure it with a toothpick. You can eat them without baking as well. If your eyebrows are about to touch the ceiling, please pull them down and try this cruelty-free recipe for this Christmas classic! Seitan absorbs flavors amazingly, so you can get creative with this recipe and mix the dough with other herbs and veggies, or add other species to your broth. The texture will be firmer if you cool it and reheat it after, it would be better if you prepare this a day before serving. GOOD FOR: Lunch, dinner. Commonly prepared in autumn-winter, for holidays. ● 2 cup vital wheat gluten. ● ½ cup chickpea flour. ● ½ cup nutritional yeast flakes. ● 2 tsp. onion powder. ● 1 tbsp. poultry seasoning. ● 1 tsp. garlic powder. ● ½ onion, finely chopped. ● 1 to 1½ cup of vegetable broth. ● 3 tbsp. soy sauce. ● 1 tbsp. olive oil. ● 2 cups hot water. ● 1/3 cup vegetable broth. ● 2 tbsp. olive oil. ● 4 cloves of garlic, crushed. ● 1 tsp. poultry seasoning. In a large bowl, mix all the dry ingredients until they’re well combined. In another bowl, mix all the ingredients as well. Slowly add the wet ingredients and knead for 10 minutes. It should be like cookie dough (not overly wet or sticky). Let it rest for an hour, covered. Knead for 10 more minutes. The final dough should be smooth. Try not to break it up when you take it out of the bowl. Form the dough into a large loaf and place it into a greased meat roasting pan. Pour the cooking broth inside, covering the dough. Bake for 1 hour, 1-hour ½. Turn it over and bake for the same amount of time. The loaves should absorb the broth completely. If they haven’t, cook until they do. The sauce left at the bottom of the pan can be used to glaze your loaf. This is the part when you can be most creative. 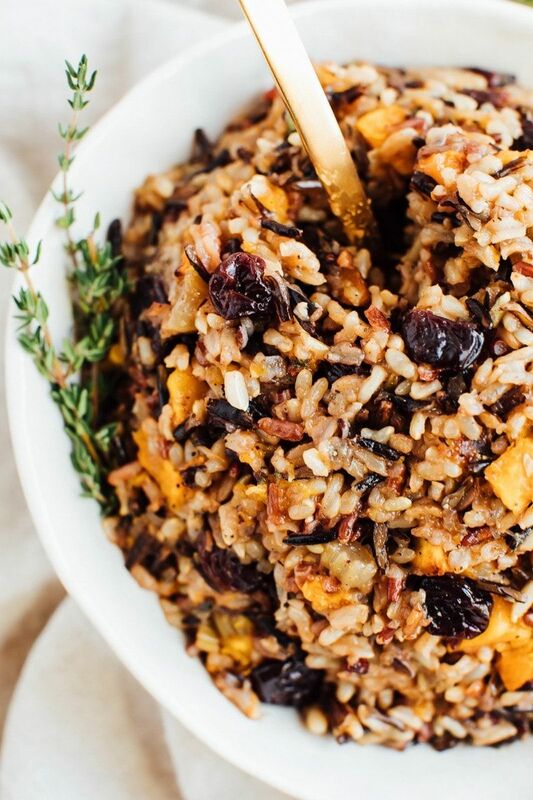 Besides the infinite number of vegan recipes you can find, you can create your own stuffing. It’s basically you and your imagination. This is a suggestion of a gluten-free stuffing (to balance a bit from the seitan!). This is an amazing food to prevent constipation as well (have you seen the amount of fiber?). The first evidence of stuffing was found in the Apicius, a Roman book with recipes, compiled in the I century A.D. We’ve been stuffing stuff to stuff our bellies from two millennia. GOOD FOR: All-day food, any time of the year. COOKING TIME: 3 to 4 hours. ● 2 cups of wild rice. ● 4 cups of vegetable broth. ● 6 leaves of sage. ● 1 tablespoon of olive oil. ● 2 medium onions, chopped. ● 6 ribs of celery. ● 3 cups of mushrooms, sliced. ● 5 cloves of garlic, diced. Add the wild rice, broth, and sage in a crockpot, in low heat. In a pan, add the oil. When it’s hot, sauté the onions, garlic, and thyme for a minute or two. Then, add the celery and mushrooms. Sauté on medium-high heat for 10 minutes and season with salt and pepper. Add the veggies to the crock pot and cook on low heat for 3 ½ hours to 4. It will be done when the broth is absorbed, and the rice is tender. You can’t have a classic Christmas celebration without this. Try this vegan recipe of eggnog (or veggnog?) and cheers! If you add brandy, the drink would be called “Tom & Jerry”. Pierce Egan, a British journalist, introduced that variation of the eggnog to publicize his book “Life in London, or The Day and Night Scenes of Jerry Hawthorn Esq. and his Elegant Friend Corinthian Tom” in 1821. GOOD FOR: A common drink for Holidays. ● 1 cup of unsweetened coconut, shredded. ● 1 cup of almonds. ● 8-10 dates. For this recipe is recommended the Medjool date variety, it’s sweeter and has a caramel-like taste. ● 1/2 – 2/3 whole vanilla bean. Soak the almonds in water for 6-12 hours. Rinse them before using. Soak the dates in warm water for 1 hour. Distribute the shredded coconut on a rimmed baking sheet. Bake, stirring every 3 minutes until it’s evenly golden brown and let it cool afterward. Mix the coconut, rinsed almonds, 2 cups of water, soaked dates and the vanilla into a blender. Turn on low, working up to high speed and let it blend for 1-2 minutes until it’s fully smooth. Add more water if desired. Pour the mixture into a nut milk bag and squeeze it as much as possible to extract the most out of the mix. Add some nutmeg, ice, and the desired liquor. You can save the pulp for other recipes or add it to the “veggnog” (liked it, huh?) for a different texture. To add the Christmas-iest touch to the vegan celebration, you must make these. Decorate them, have them as dessert with hot chocolate or make a tasty army of gingerbread men. The largest gingerbread man was made by the IKEA team in Oslo (Norway) in 2009. It weighed 1435.2 pounds / 651 kg. GOOD FOR: Commonly prepared in Holidays. Combine the flours, baking powder, baking soda, cinnamon, ginger, nutmeg, and cloves in a bowl. In a large bowl, mix the coconut and the sugar. Beat for 1-2 minutes until the mixture is nice and light. Add the water, molasses, vanilla, and beat for another 30 seconds. Gradually add the flour mixture to the creamed sugar mixture, beating to combine. Wrap the dough in a plastic wrap and refrigerate overnight (or for at least 2 hours). Before rolling, let the dough sit at room temperature for 30 minutes to 1 hour. Preheat the oven to 325˚ F.
Roll the dough directly onto parchment paper, until its ¼” thick. Use cookie cutters to cut out the dough, use a flat spatula to gently remove the excess of dough. Keep re-rolling and cutting out the dough until it’s all used up. Introduce the unbaked cookies into the freezer to chill for 10 minutes. Bake for 8-10 minutes, until the cookies are lightly browned around the edges. Now that you have a whole meal idea for a classic vegan Holiday, surprise your friends and family with these dishes. Make sure to receive the New Year with a “veggnog” in your hand! Once you see the difference if these dishes work for you, and they will, why not make everyday, a healthier day? Have fun with Vegan Dishes with these entertaining cookbooks. They will not just leave you smiling, but your tummy will never go rumbling again. Michelle Torres is a vegan physiotherapist obsessed with learning new things. In her natural state, she'll be with a cup of coffee and some music writing a post about veganism or laughing. Probably the latter.